(Bloomberg Opinion) -- The health of the U.S. economy largely comes down to consumers’ attitude and spending. That’s why some investors were anxious about the contentious government shutdown that lasted into early 2019; any lingering concerns could dampen the outlook for future growth. Judging by JPMorgan Chase & Co.’s first-quarter earnings, that saga has barely been a blip. And that might just mean the calls for a U.S. slowdown have been premature. JPMorgan, the largest credit-card issuer in the U.S., reported that spending on its cards jumped 9.8 percent to $172.5 billion during the first three months of the year, while volume in its merchant business increased 12.7 percent. Card loans grew, as did margins. In a statement, Chief Executive Officer Jamie Dimon called consumer spending “robust.” He rattled off observations that aren’t exactly a secret: “The U.S. economy continues to grow, employment and wages are going up, inflation is moderate, financial markets are healthy and consumer and business confidence remains strong.” He added on the earnings call that December’s violent market sell-off was an overreaction. Asked by journalists if this benign view contrasted with earlier assessments, Dimon and Chief Financial Officer Marianne Lake said that nothing has really changed and that they have been generally quite optimistic. Risk markets indicate they feel the same way, Lake said, while Dimon reiterated that a confluence of events at some undefined point in the future could cause a recession. Still, investors needed this reminder. The Treasury yield curve, which experienced its most significant inversion yet in late March, continues to weigh on the minds of money managers as they contemplate when one of the longest economic expansions in U.S. history will end. Just in the past week, economists at Goldman Sachs Group Inc. lowered the chance of a recession over the next four quarters to about 10 percent from 20 percent, while Guggenheim Partners said the odds of a recession starting within 24 months has more than doubled. At this point, handicapping a slowdown feels like a shot in the dark. For example, JPMorgan slowed its loan growth, which Bloomberg Intelligence’s Alison Williams said “is probably a good thing. If we are thinking about being closer to a recession, and late in the cycle, that’s what you would like to see.” Its provision for credit losses was slightly above analysts’ estimates. Doomsayers could latch onto those figures as a reason for caution. Overall, though, the takeaways from JPMorgan’s earnings are far more positive than negative. 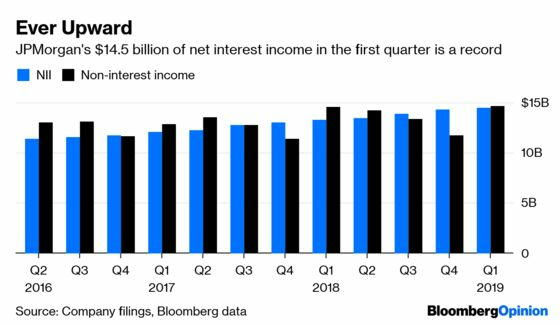 Specifically, the crucial net interest income figure, which measures the spread between revenue from customers’ loan payments and what it pays depositors, jumped to a record $14.5 billion in the first quarter. While margins will be relatively constant, it doesn’t mean net interest income won’t grow, Lake said. The more than $58 billion estimate for 2019 would be a $2.5 billion increase from 2018. Considering just how far long-term interest rates fell between November and the start of January, that’s quite a clean bill of health for the bank. Trading revenue beat analysts’ estimates by dropping only 17 percent to $5.5 billion, compared with the projected 18 percent decline. As for declining profit at the firm’s smallest unit, asset and wealth management, executives remain optimistic. Revenue was flat reflecting lower markets, but JPMorgan is continuing to invest in the business. One moment in time doesn’t change the level of “excitement” over the longer term, Lake said. It’s probably too soon to assume that the strong showing by America’s largest bank by assets will send the S&P 500 breezing past its previous record highs. But for those fretting about a potential bubble in U.S. stocks, JPMorgan’s results at least provide some evidence for support at these lofty levels. The bank’s shares themselves are set to trade at the highest since early December. Similar figures from the rest of Wall Street next week would only further buttress the equity market’s astonishing rebound in 2019.